Bosses in a national park that has been hit by six moorland blazes recently have pleaded with the public to take extra care not to start fires. The Peak District National Park Authority is putting up signs across the area to remind walkers and outdoor enthusiasts about the risk of fire. A spokesperson for the authority said: “Moorland fires are especially tragic at this time of year when ground-nesting birds are rearing young, and other creatures, including lambs, can be caught in the flames. Firefighters and national park rangers have recently tackled fires at Dovestones near Oldham, Marsden Moor, Ramshaw Rocks near Warslow, Walker Edge near Broomhead reservoir, Moscar Moor near Ladybower and Reaps Moor near Warslow. The spokesperson added: “People visiting the moors are asked never to light barbecues or campfires anywhere near them, nor to drop cigarette ends or leave glass behind. Car users are asked not to throw cigarette ends out of car windows. 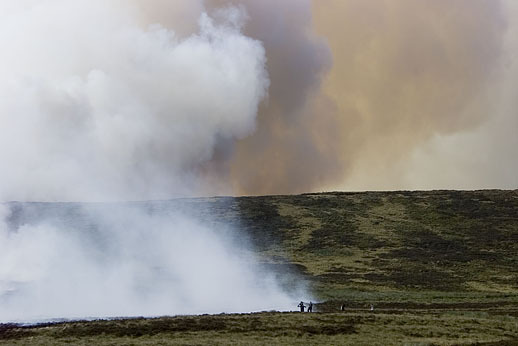 Peak District national park head of field services Sean Prendergast said: “It is glorious weather for walking on the moors, but we’re asking people to be especially careful at this time of high fire risk. “These are not empty places; they’re areas of international importance for their wildlife and plants, and they absorb and store carbon which helps tackle global warming. 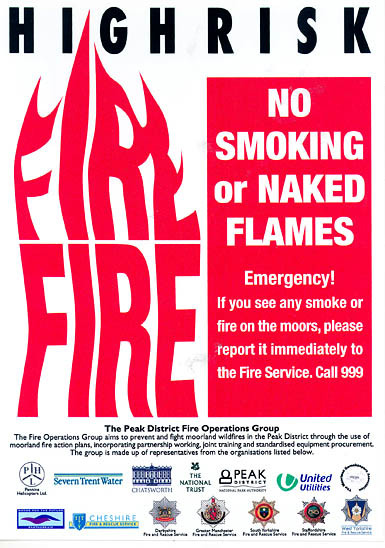 Fire warning signs have been erected by the national park authority, landowners including the National Trust and United Utilities, and gamekeepers responsible for the moors. Rangers carry out extra fire patrols during dry weather, and the Peak District Fires Operations Group, which involves six fire and rescue services along with the national park authority, is on standby to tackle any blaze in a remote area. The fire severity index is forecast to rise to level four on Good Friday, one stage below the point at which Countryside and Rights of Way Act open access land is automatically closed. Public footpaths and bridleways remain open even if the exceptional level five triggers an access land closure.